Assumption offers a variety of stimulating enrichment and athletic summer camps for girls and boys in grades K-11, including 10 new camps. Check out our various camps listed below and click here to register today! The Assumption Rockets will be offering a high-level skills clinic led by Head Coach Stacy Pendleton, and his rocket varsity basketball players. Coach Pendleton has won nearly 400 games, a state championship, and numerous coach of the year awards. In addition, he has sent over 25 players on to play college basketball. Come learn from the best and interact with rocket varsity players while focusing on all the fundamentals, and competing in three on three, five on five, and Rocket Rodeo competitions. The Rockets Elite Shooting Camp is designed for shooters who have the basic skills of shooting mastered and will focus on the more advanced components of shooting and scoring. The camp will break down each camper’s shot, and each player will receive individual attention on ways to improve her shooting. Players will receive an evaluation on their shooting and scoring ability as well as information on how they can improve in the off-season. CAMP LIMITED TO FIRST 50 APPLICANTS. *If interested, please bring money for snacks. Come join the Assumption cheerleaders for two days of fun-filled cheerleading! You will learn proper technique and fundamentals of high school cheerleading from the AHS varsity cheerleaders and coaching staff. The two days will be broken down into blocks of cheer, dance, jumps, and stunts! Assumption cross country has a tradition of excellence, including six state championships and three Nike Cross Country National Championship berths! The camp is led by Head Coach Barry Haworth and is a great way to prepare for the upcoming cross-country season. Campers will do daily runs, and Coach Haworth will help the girls learn effective injury prevention, stretching routines, and most importantly, how to make running fun! This camp will offer an enjoyable experience for all players. We will teach basic field hockey stick skills along with general team concepts. Campers will be grouped based on ability and age. We will have introductory icebreaker-type games, and both small and large game situations. Camp will end with lively competition! For questions, please email jody.schaefer@ahsrockets.org. This camp is a pre-try out skills camp for the more experienced player. We will focus on skills through small group instruction with elite college and high school players and will then apply those skills in both small game situations and full field experiences. Advanced stick skills (chips, lifts, sweeps, 3D skills) will be taught along with basic skill polishing. This camp is great prep for ANY high school tryout or preseason training, no matter the player’s high school choice. For questions, please email jody.schaefer@ahsrockets.org. Assumption’s lacrosse camp is designed to teach and develop the fundamental skills of the game: throwing, catching, cradling, shooting, feeding, ground balls, and offensive and defensive skills while focusing on improving participants’ level of confidence. 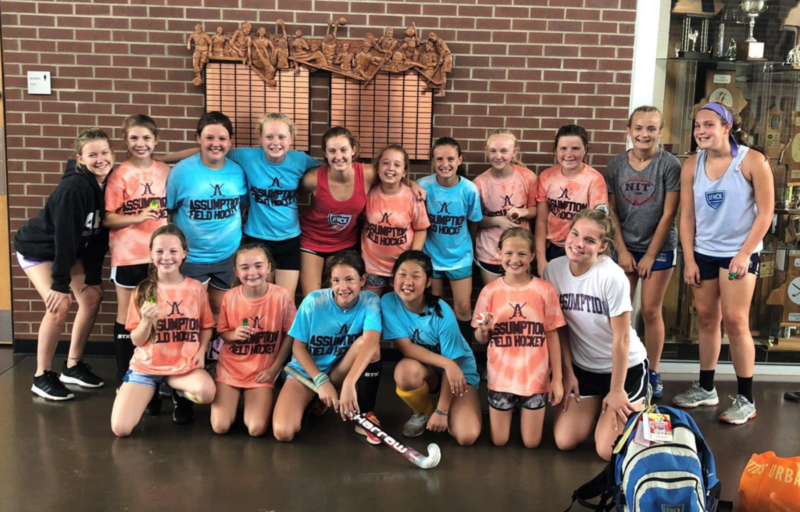 Our camp offers players the opportunity to improve their stick skills and conceptual understanding of the game through challenging drills, skill building activities, and full-field scrimmages. The camp staff includes the AHS coaching staff, along with varsity and rising JV players. The Assumption High School soccer camp is designed for young players looking to develop their fundamental skills and grow their love for the game. Our goal is to instill the joy of the game in each camper by focusing on sound technical development in a fun and inclusive environment. The Assumption High School advanced soccer camp is designed to further player development and introduce campers to higher levels of technical and tactical training. Our goal is to prepare campers to play at the high school level, by focusing on team concepts. 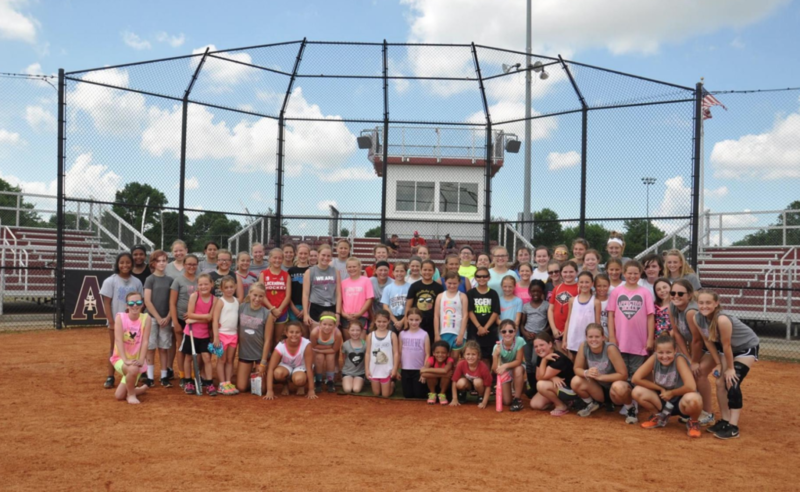 We invite you to learn to play softball the Rocket way! Players will be taught by the Assumption coaching staff as well as current and former players. Our camp counselors will also include current college softball players. Campers will be challenged through competitive games, and fundamentals will be taught to build confidence! Start your summer with us, and have fun being active while learning new skills. Email Coach Pinkston for questions at lisa.pinkston@ahsrockets.org. This camp, led by 21-time state champion Coach Ron Kordes, will offer instruction in basic and intermediate skills of volleyball. Campers will be grouped per ability to maximize their individual learning experience. Attention will be directed to playing strategies, physical and jump training, teamwork, leadership, and having fun! In our camps geared for grades K-2 and 3-5, girls will have the opportunity to spend time with their peers doing activities, making crafts, role-playing, singing, dancing, and learning one of the most important life lessons: that she is a valuable person, she has dignity and worth, and what she does makes a difference. We will focus on building self-esteem and helping young girls create and maintain a positive body image! Come and join us as we learn a little more about ourselves and each other. * Special note – If your daughter attended this camp in the past, it will NOT be the exact same lessons/instruction/activities, however many of the same concepts will be covered. New this year is the addition of a day camp for girls in grades 6-8. Life in middle school is challenging. This camp will offer fun but meaningful lessons and activities on Affective Skills like those taught in the camps for younger girls. However, there will be a more intense focus on topics such as dealing with friendships, peer pressure, social media, and managing stress. Bonus: Each camper will receive a patch which can be placed on the back of their sash or tunic if they are a member of Daisy Scouts, Brownies, or Girl Scouts. However, campers are NOT required to be a member of a Girl Scout organization to attend. ALL campers should bring a sack lunch with a drink which they will eat with their new friends during a lunch break. This camp is not to be myth-ed! Students spend a week exploring and interacting with the gods and goddesses of Greek mythology. All are welcome—beginning heroes and Percy Jackson fans alike! By the end of camp, students will increase their understanding of classical mythology and its echoes today. The camp culminates in a symposium that highlights students’ interpretations of myth through visual and performing arts. This hands-on camp will explore each of the main visual arts: painting, ceramics, drawing and sculpture. Campers will complete at least one project in each discipline to take home. *Clay pieces may take slightly longer to process and will be available for pick up the following Thursday 6/20) *Campers will get messy so please dress accordingly! Cover ups are available, or campers may bring their own. How do Luke and Rey mirror Henry V? Does Kylo Ren’s plight echo the drama of Hamlet? Could Han and Leia star in Much Ado About Nothing? Come explore the connections between the Star Wars saga and the plays of William Shakespeare. Students will discover how classic drama influences modern cinema, read and perform Shakespearean texts, and develop their knowledge of both Elizabethan England and a galaxy far, far away to understand how the Bard will be with us always. Prior experience with Star Wars and Shakespeare is encouraged but not required. Does your camper love to watch baking shows? Would they like to learn some of the techniques from those shows? In this four-day camp, campers will learn how to create a range of baked goods. There will be a different theme each day, and campers will learn the skills needed for baking each item. Campers will then bake the treats themselves with the help of an experienced baker. There will be time at the end of each day to taste what we make! At the end of the week, each camper will be a master baker! Past campers have baked cake, pies, bread, and more! Campers will have the opportunity to bake and decorate their own desserts, with an emphasis on decorating. Each camper will learn the skills needed to decorate beautiful desserts. The class will cover basic piping and decorating skills, as well as more advanced decorating, such as how to make buttercream flowers. Campers will also learn how to make the icing they use on their desserts. A variety of techniques will be covered over the four-day camp, leaving the campers will skills to decorate desserts for years to come. Campers will have an opportunity to learn about and bake a variety of cookies. They will bake cookies from around the world, holiday cookies, and traditional American cookies. Campers will learn the skills to make each cookie on their own, and by the end of the camp they will be a cookie connoisseur! Spend a week learning the ins and outs of hand lettering! Campers will learn techniques and use calligraphy markers to learn how to make their handwriting stand out. A unique opportunity to cook along with Assumption High School’s own Chef for three days. Learn basic culinary skills as we prepare an exciting and delicious meal each day. Entice your taste buds with Italian flare when we prepare an Italian meal from scratch. Hang on to your sombrero as we turn up the heat and south to the border to cook some authentic Hispanic Cuisine. A unique opportunity to cook with Assumption High School’s own Chef for three days. Explore a higher level of culinary skills as we prepare exciting and delicious meals each day. Entice your taste buds with the tastes of Thailand as we prepare an authentic Thai meal from scratch. Bring your sense of adventure as we explore the Open Seas with a Seafood lover’s palate. Venture to the Caribbean Islands as we turn on the heat with some Authentic Latin Cuisine. This fun and fast paced camp introduces young actors to the wide-open world of drama. 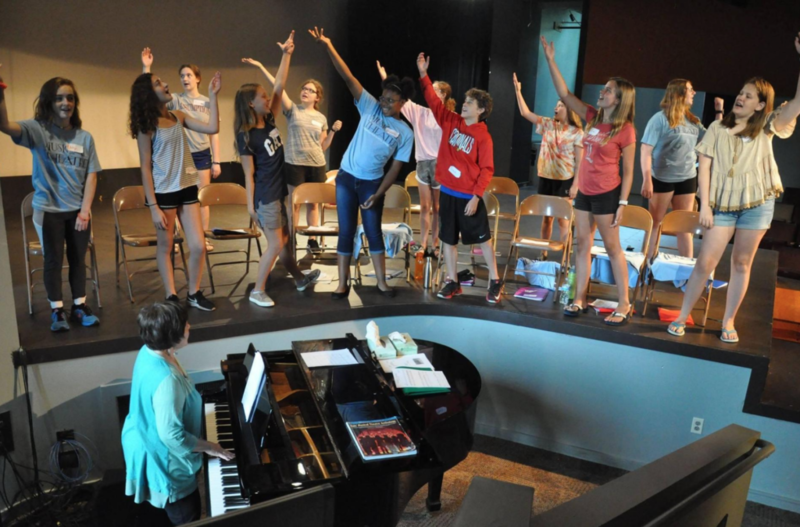 Instructors will lead students in warm-ups, creative drama activities, and basic acting exercises that will help students to feel confident using their voices, bodies, and imaginations as instruments for creative expression. This camp will end with a culminating showcase. This camp is for the student who is interested in digital photography and has a digital camera to use for camp. The camera does not need to be a DSLR but needs to have the options to change aperture, and shutter speed. We will learn about action photography, nature photography, portraits, and fun still life photography. At the end of our camp week we will showcase our creations in an art show for family. Learn to express yourself in poetry. Participants will explore several common types of poetry and try their hand at composing and presenting their own poems. Learn the essentials of building and defending a case with the award-winning debate team at AHS. Participants will explore the parts of an academic debate round, develop a strong claim, find solid evidence to support it, and explain their case with clear reasoning. Discover techniques to create interesting page layout designs and learn some fun photography tips too. 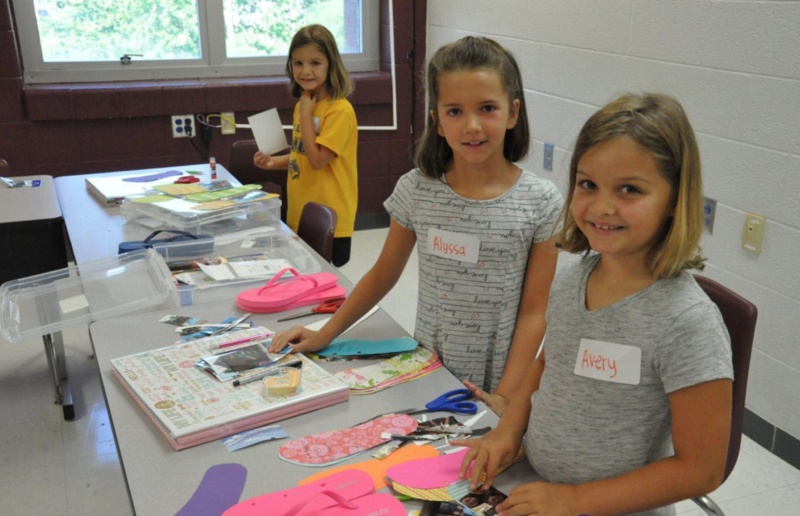 Campers will be creating four (4) scrapbook projects during this camp including a traditional scrapbook. Each camper will be given a personal scrapbook supply box to take home at the end of the week. All supplies will be provided, but participants will need to bring their own pictures for projects each day. No scrapbooking experience necessary. Campers will learn basic stitches that will help them make repairs to torn seams, hems and loose buttons. They will also learn how to hand quilt and be given the opportunity to create a personalized quilted pillow to take home. If time permits, campers may create a second project. *Fabric will be provided, but campers have the option of bringing their own material to personalize their creation. The middle school years can be fun and exciting, but they can also cause a lot of stress! From the pressure of homework and grades to the challenges in dealing with friends and parents, it’s impossible not to feel stressed at least some of the time. But stress can be a good thing – if we have strategies for dealing with it! This camp includes lots of great activities that will help campers learn how to manage their emotions, handle disappointment, and communicate effectively. They may be surprised how much fun it is to get rid of stress! Thank you for your interest in Assumption High School’s 2019 Summer Camps! Spaces fill up quickly so register online today!